At its first performance on April 21st, 1948, with the BBC Symphony Orchestra conducted by Sir Adrian Boult, the symphony made an immediate and profound impression. The final Epilogue invoked most comments with one commentator saying it was ‘like nothing else in music – a wholly pianissimo movement like a long farewell’. Deryck Cooke was at the first performance and wrote of the ‘ultimate nihilism’ of the last movement – ‘every drop of blood seemed frozen in one’s veins’. For anyone familiar with this masterpiece, it certainly makes for absorbing listening… In sum, another bold anthology from Albion Records. … we can start to understand how that very first moment of the work’s life felt. Alan Rowlands, a distinguished pianist and teacher, has edited Mullinar’s own arrangement of the work for two pianos and recorded it with Adrian Sims. To my mind, it is one of the greatest recordings of the composer’s works. In this raw state one hears things in the symphony that one had never heard before – in my case in hundreds, probably thousands, of previous listenings. 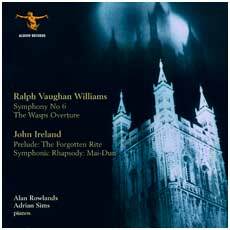 This… is Vaughan Williams’s own clear voice, his own inspiration, and a work grown not so much out of the soil of England as out of the rubble and the graves of the bloodiest war in the history of the world. And never has that been so clear as it is in this historic, and indispensable, recording.